Shelagh Watkins is writer, editor and publisher at Mandinam Press, and author of two books: Mr. Planemaker’s Flying Machine and The Power of Persuasion. She set up the Children’s Fiction group on LibraryThing, the Published Authors group on Goodreads, and the Published Authors Network group on LinkedIn. 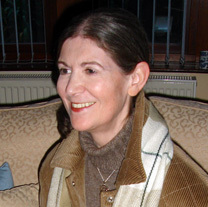 Shelagh also created the Published Authors Network on Ning and is administrator of the Published Authors forum. There are over four thousand members in the combined groups and networks. When she is not networking, administrating, publishing or editing, she miraculously finds time to write!Shelagh’s first novel, Mr. Planemaker’s Flying Machine, was serialised on radio during May-July, 2009 (daily episodes on Preston FM’s Chat City with a weekly forty minute omnibus on Sundays). Thanks for visiting my weblog, Gina! Thank you for your part in putting together the contest for Aggie Villanueva’s wonderful picture, “Valle Pintado.” I was pleased to see my work posted on your site. I will have to read your books now and am sure I will enjoy them. Congratulations on your success in the competition, Ed! I have enjoyed visiting your site. I am a member of Goodreads and read where authors have been interviewed by you. How can I get interviewed? I so want to get things like this done for my book published in May 2010. I’m writing to see if you’d be interested in reviewing author Erica Nelson’s book Happiness Quotations: Gentle Reminders of Your Preciousness. Erica is an inspirational happiness coach and author. She wrote Happiness Quotations as a unique and inspiring way to uplift your day. Happiness, she believes, is a practice that you can start, today, from exactly where you are. I’ve been working with Erica to increase the visibility of her book online. We’re in the process of setting up a blog tour for April 25 through May 6. Would you be interested in being a stop on the tour? We have three different ways your blog could participate: (1) We would be happy to provide you with a copy of the book for a review you would post during those two weeks, or (2) Erica could provide a guest post for your blog or (3) you could post a Q & A with Erica using your questions or questions we provide. If you’d like more information about Erica Nelson and Happiness Quotations, feel free to contact me or go to Erica’s website, http://happinessquotations.com/. I hope you will review “THE COVERING” by Miss Cheyenne Mitchell. Ask the question “WHAT IF NEARLY 200 YEAR OLD VAMPIRES WERE RAISING TWO, NORMAL, TEENAGE DAUGHTERS OF THEIR OWN FLESH AND BLOOD?” Take the horrifying journey with Celia Bellis and her sister , Drew, as they uncover the deep, dark, nefarious secret being harbored by their family members. Also, “SYROIA” by Miss Cheyenne Mitchell. “WHAT IF THE DEMONIC SPIRIT OF A LONG DEAD MURDERER YOU NEVER KNEW WAS AFTER YOUR SOUL TO CONTINUE ITS’ KILLING SPREE?” Yet IT is someone closer to you than you know. Let Arquito Desmunde tell you about the horror he suffered beginning at the age of 22 years old of demonic possession, which happens to be the same age the demon was when it was murdered over one hundred years ago. Hi there Shelagh! You have a nice blog! I wondered whether it was possible for you to do a feature post or a mention of the site, ReadWave?